Directly north of St. Louis, across the Mississippi River, is an historic and beautiful village. ‘The New England of the Midwest’ has held onto its nineteenth-century roots, offering a gorgeous look into the architecture – and to some point, the life – of these earliest area settlers. Listed on the National Register of Historic Places, the entire village of Elsah has strict limitations on what can be built here, making one of our historic B&Bs a unique destination for your southwest Illinois vacation. A US Senator and quarry-owner was the founder of the town. James Semple offered free lots to anyone willing to build their home with his own quarry stone. 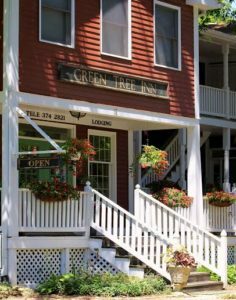 The town’s nickname refers more to the 19th century styles that influenced so many New England homes, as many buildings in the town were built to these standards while showing some more Midwest-rustic tendencies. As a major river shipping point of agricultural goods, the town flourished. When the town was threatened by the railroad, it found new life when Principia College of Christian Science was founded in the early 1900s. When the Great River Road was built, following the Mississippi River, the town was again revitalized. Visitors love the ambiance, history, and natural beauty of our town! Visiting is like taking a step back to earlier times. All the homes are privately owned, and all the businesses are housed in historic buildings. Sorry folks, there are no box-stores or fast-food here… just the serene feel of a different time in America. If you enjoy bald eagles, then this is the place to visit. The eagles make their home all along the Mississippi River, and Jersey County seems to be a popular nesting area. Three recreational park areas within 10 miles offer some of the best eagle-watching in the state! Come during the fall and winter, as viewing is best once the leaves are off the trees. 33 miles of bike trail also await your visit. The Sam Vadalabene Bike Trail is a Rails-to-Trails bikeway that stretches from our town, along the Great River Road to Pere Marquette state Park. Of course, you can take your binoculars along for bald eagle-viewing from the trail! Whether you come for the town’s atmosphere, the biking, or the parks, Elsah is a perfect getaway destination. Member inns of the Illinois Bed and Breakfast Association welcome you to a simpler time and place, away from the frenzy of life.